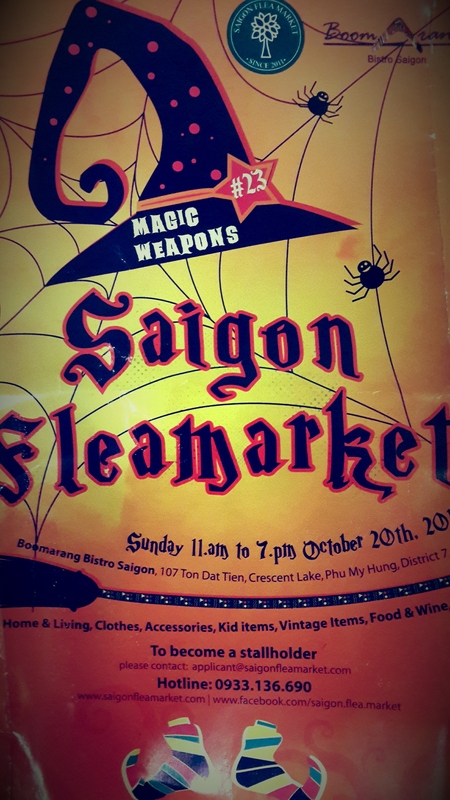 The popularity of the Flea Market has certainly increased in recent months, with organizers now offering an additional monthly market at Vista Bazaar in District 2. And, as I type, I’ve just received notification that they’ll be offering 2 market dates a month in District 7, alone, as of January 2014. I’ve visited the Flea Market a couple of times since moving out here, but have never had quite such a successful time as I did last weekend. The theme was Halloween, but short of a few pumpkins dotted around, there wasn’t anything garish or unsightly to ruin the relaxed Sunday afternoon vibe. The stalls are spread across the 1st floor of the Bistro and spill out onto an outdoor courtyard of the Crescent Mall. I find this area can be quite uncomfortable in Saigon’s intense afternoon heat, so I always try to arrive early and get all my shopping done before 1pm. Another option is to visit in the evening; most stalls are open until 7pm. Hữu Là La – Here, I bought a pair of floral flip-flops and a winter scarf; 70,000vnd (£2.05) and 100,000vnd (£2.93) respectively. They also sold some interesting cushions and home accessories that would be right at home in an old English thatch cottage. Petite Note – A gorgeous home-made jewellery stall where I bought a bronze moustache necklace and a pair of matching earrings; 70,000vnd (£2.05) and 30,000vnd (£0.88) respectively. I also loved some of the handmade pictures, signs and clocks sold by Qủa tăng vẽ tay. It’s easy to glorify the country that you’ve expatriated to. You like to see the best in your surroundings and focus on all that is positive. At the end of the day, if you just focus on the negatives, then what was the point in leaving your home town? However, it’s also important not to lose sight of reality. Looking back over my blog entries for the past few months, it’s abundantly clear that I’ve had a whale of a time in my new home. But all it takes is the blink of an eye before the reality of your situation kicks you in the teeth. It’s a story as old as time and one that has been retold a hundred times over. Ironically, a cautionary tale that’s told by expats like myself, to unsuspecting tourists. But last night, it finally happened to us; my boyfriend was mugged. Waiting for a xe ôm after a meal out with his work colleagues, a man approached him and tried to put his hand in his pocket. As my boyfriend wrestled with this man, a middle-aged woman approached from behind and made a clean sweep of his phone (unfortunately a relatively new smart phone) from his other pocket. She then swiftly jumped onto a motorbike and sped away, all the surrounding onlookers just sat idly as if watching their favourite sport on TV. It is frustrating, that at times like these, you expect to be able to approach the police for help. You’d assume that’s our right as tax and law abiding residents (with residency cards to prove it! ), but of course you can’t. It is so important that you never lose sight of the fact that Vietnam is still a developing country, ridden with poverty. I love Saigon, and this incident hasn’t shaken my love for the Vietnamese population in general. The number of friendly locals we’ve met certainly out-weighs the hostile ones. I think it’s just an important message to send out to any expatriates or travellers passing through any developing country. It’s easy to say, “that will never happen to me” (we’ve been saying that for 2 years ourselves) but it can happen and when it does, you unfortunately just have to accept it and move on. It’s a cruel reality, but life’s just too short. I could hear the music pumping the moment I stepped out of the lift. Secretly hoping it was my students having the party, I skipped down the hallway. 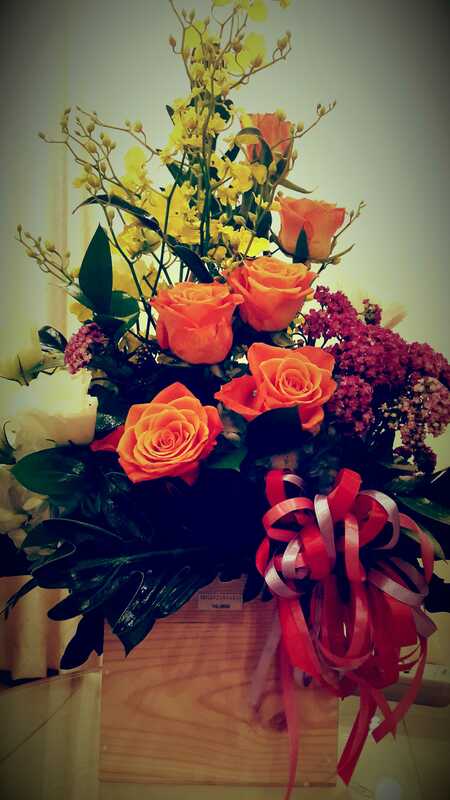 Sure enough, as I walked into my classroom, I was presented with balloons, food and drink on the tables and a huge bouquet of flowers on my desk. Not to mention the handful of students having a good old Karaoke session. I just manage to take in a breath before all my students noticed my presence and burst into a round of applause. Never a huge fan of being the centre of attention (*cough cough*) I actually felt nervous as I walked down to the front of the room. But really, it shouldn’t be me that takes the credit for their achievements, they have come such along way in the past 2 months and it is solely down to their hard work and determination. As I’m sure teachers all over the world will agree, it’s a rarity to find a dedicated class of teenagers. But these guys were just that; they made my job a breeze. As they shouted “thank you teacher” and offered me some Jollibee fried chicken, fries and ice-cream, I couldn’t help but think, “it should be me that’s thanking you guys”. 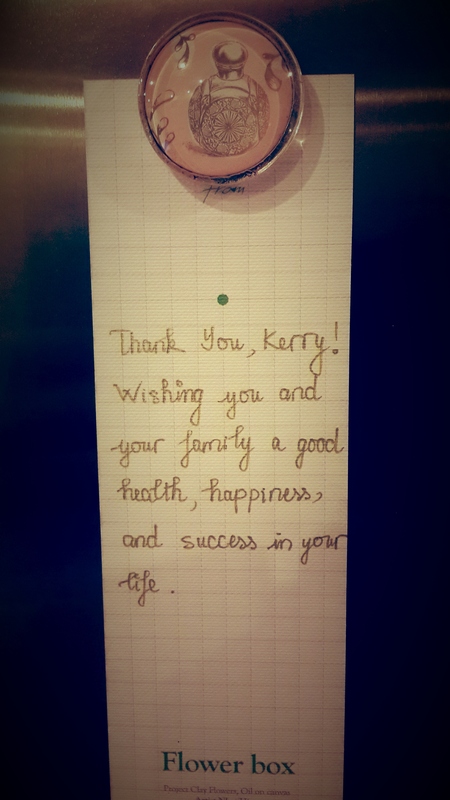 Teaching is tough, even at the best of times, especially with a youngster class like this one, but its moments like this that makes the late nights, lesson planning and exam marking totally worth it. I am one lucky teacher! An old colleague sent me this video of Saigon in 1945. I especially love the old-style cyclos and the prominence of the Áo Dài! Incredible how things have changed since then. During the planning stages of my expatriation to Vietnam, whenever anyone spoke of the local street food, all that came to my mind was phở. And that was only because I once went to a Vietnamese restaurant on a visit down to London. 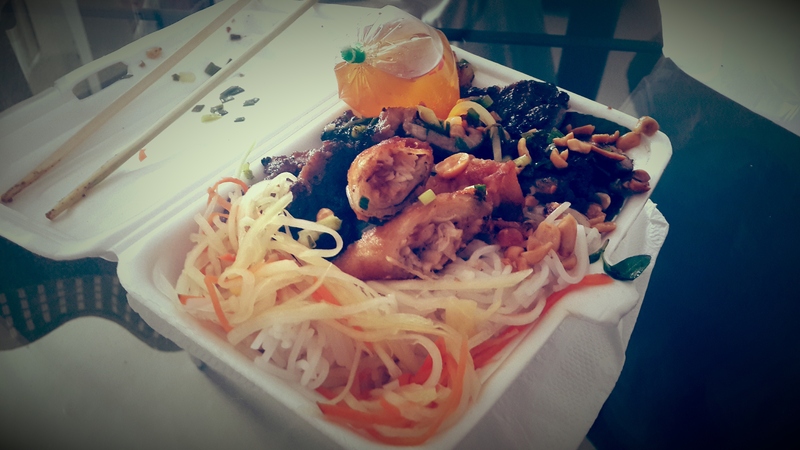 People used to give me varying accounts of Vietnamese street food; some strictly warned me off the stuff, others said it was the best food they’d ever experienced. I honestly had no idea what to expect. I have since learned that Vietnamese street food is amongst some of the tastiest (and cheapest!) food that I’ve ever had the pleasure of eating. Granted, this is after numerous bouts of food poisoning and 2 trips to the local hospital, but what doesn’t kill you makes you stronger, right? Vietnamese street food has to be approached with caution, but the moment you find that one vendor who practises proper food hygiene (ie: who doesn’t sharpen their knives on the curb), you just know you’re onto a winner. 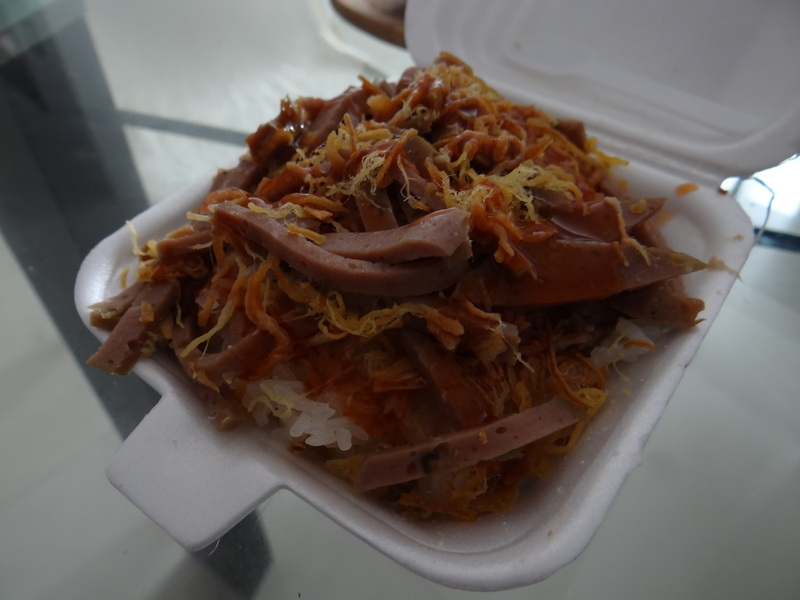 This is my go-to lunch option, although the locals actually tend to eat it for breakfast. 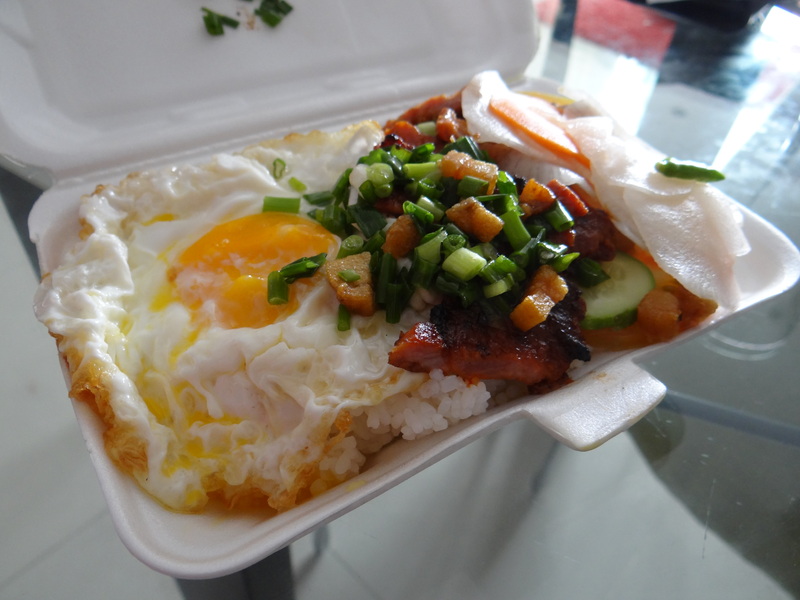 The broken rice is generally served with a BBQ’d pork chop and an optional egg. I tend to forgo the egg (despite the misleading photo). It’s usually served with an assortment of boiled vegetables and a small bag of fish sauce, which is delicious on the proviso you ignore what it’s made from and instead trick yourself into believing it’s just sweet chilli sauce. This particular cơm tấm came with some diced pork crackling sprinkled on top. These little tykes have led to the demise of my ‘diet’ since a lovely local lady set up shop just outside my school. Now, a day rarely goes by where I don’t pick up a small bag. They taste just like Aunt Bessie’s roast potatoes, with the addition of a generous sprinkling of chilli. They’re deep-fried dough balls and are quite frankly heaven-on-earth. MUST be accompanied with a glass of water though! This is a bit of a ‘cheat’ street food. The base consists of a serving of plain instant noodles tossed with morning glory. Shreds of beef are then sprinkled on top. It’s all served with a small bag of soy sauce (which I give or take depending on my mood). This is a late night snack option, with the convenience of a 24/7 vendor just outside my apartment block. OK, this isn’t strictly a Vietnamese dish, but it is still purchased from a street vendor. This is a glorified chicken kebab, served on toasted pita and accompanied with salad and the BEST garlic mayonnaise I’ve ever tasted. This is definitely the guilty pleasure. 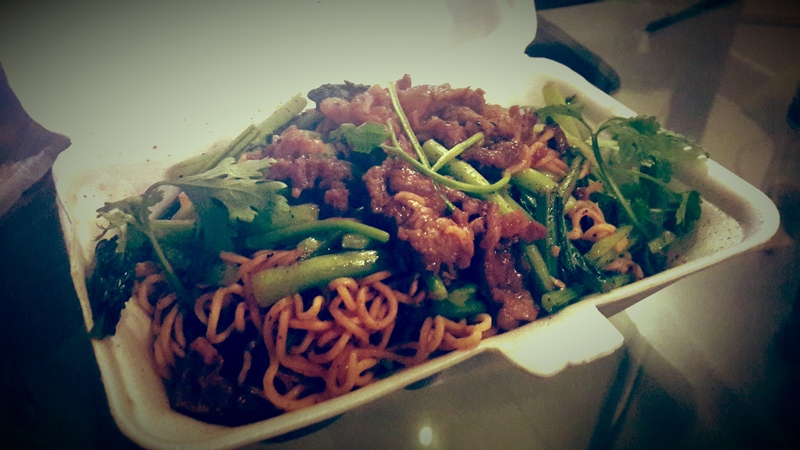 I know this photo doesn’t look like street food, but it didn’t look quite as presentable sprawled inside a plastic bag. 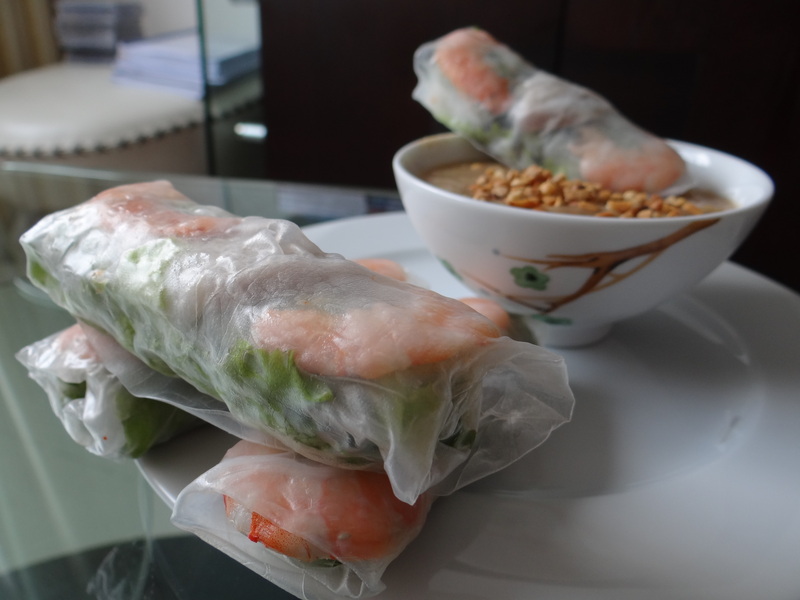 Fresh spring rolls are a travellers favourite in Vietnam; they make a great DIY experience. They usually consist of a couple of prawns, some processed pork slices and a whole smattering of leafy bits (coriander, mint etc). They can be served with a variety of dipping sauces, but my favourite is definitely the one photographed; a satay sauce with peanuts. 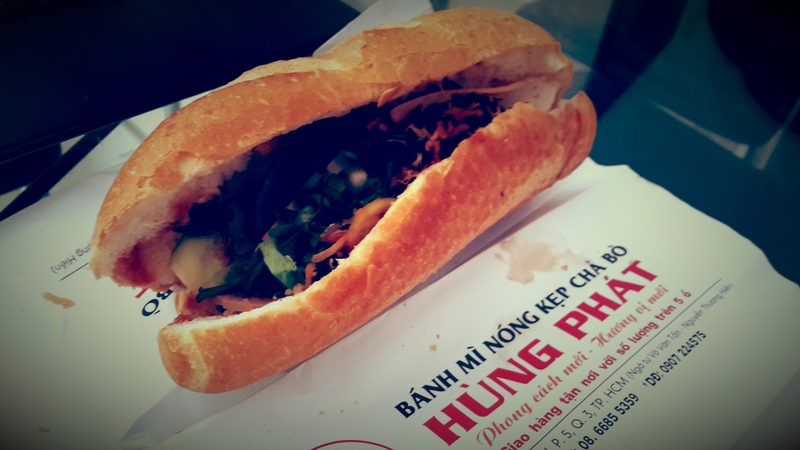 Who can forget the reliable bánh mì? Not the greatest of photos, but the dish speaks for itself. 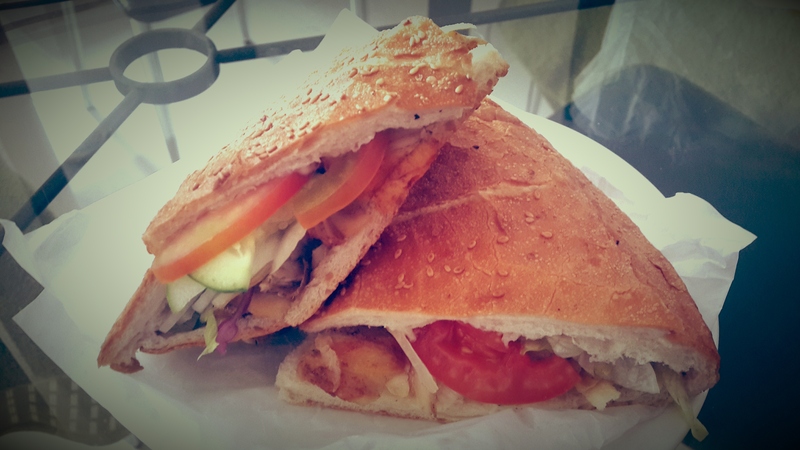 A Vietnamese sandwich served on a warm baguette. The filling can be questionable at times, some vendors enjoy adding a bit of pig brains into the mix. 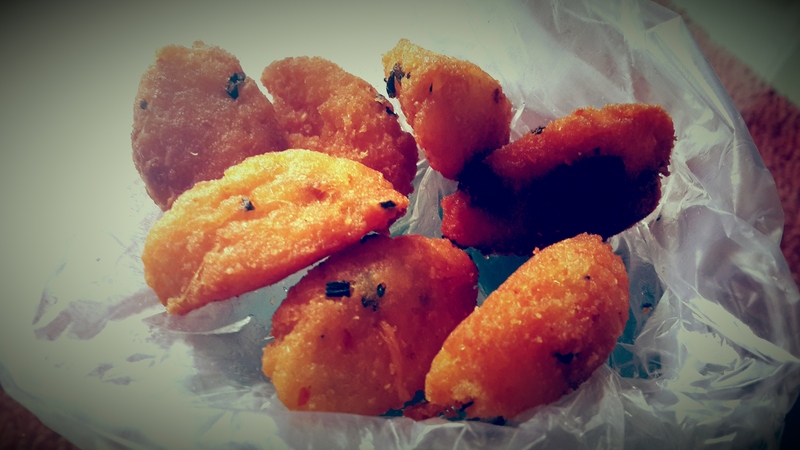 Therefore, I’ve learnt to visit the vendors who allow you to choose your own filling. Chicken, pork, paté and salad is a firm favourite. Although you can’t go wrong with the simple cream cheese and cucumber ones they also offer. 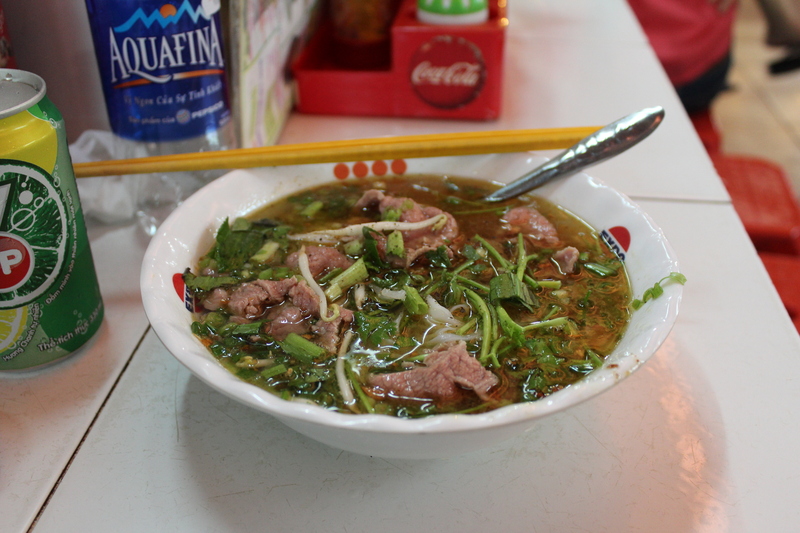 No Vietnamese street food list would be complete without the infamous phở. Honestly, it’s not my favourite of the local dishes, and I often end up just slurping the broth and leaving the rest. Regardless, it’s still the country’s national dish. Phở comes with a variety of meats, depending on your vendor. This particular bowl was purchased at Ben Thanh Market and included just beef. Other local soup dishes include: Bún Bò Huế and Hủ Tiếu (all much of a muchness if I’m honest). I’d be lying if I said these next two dishes were a firm favourite. I’ve eaten xôi mặn once and while it was OK, it didn’t really blow me away. The dish consists of a bed of sticky rice mixed with a creamy mayonnaise-like sauce, topped with a spoonful of paté and slices of processed beef. Like the cơm tấm, a sprinkling of pork crackling shavings garnished the meal. Another one timer, but very delicious nonetheless. These are rice paper rolls stuffed with mushrooms and beef. 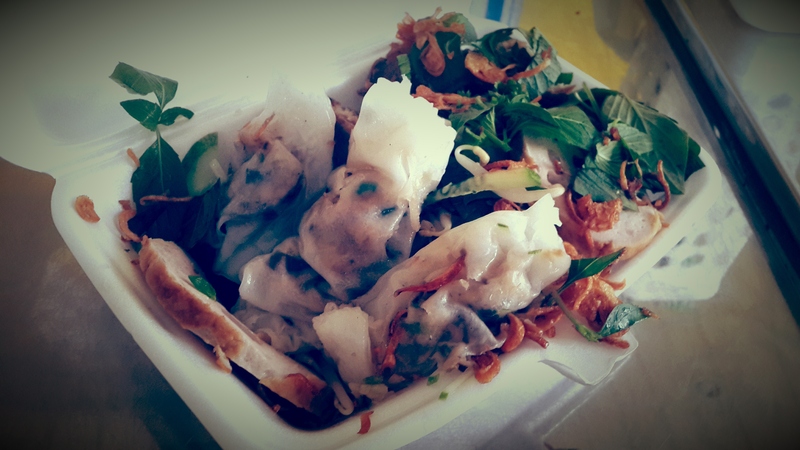 They have a similar consistency as the fresh spring rolls but are served with rice noodles and additional meat slices. As usual, plenty of herbs decorate the dish. Obviously, this isn’t a definitive list and I’d love to hear from anyone who has any other favourites that they feel should be added to the list!